One of the first steps you must perform before using a new hard drive for backup purposes is to format it. Formatting refers to the process by which the hard drive is prepared to store data. This includes creating a file system on the drive so that data can be organized into files and folders. Virtually any new hard drive will come pre-formatted, so you can plug it into your Mac and begin using it 'out of the box.' The problem is that it has probably been formatted with a Windows PC native filesystem. While your Mac can read and write to such filesystems, it will not be as efficient as the native macOS Extended file system that macOS wants to use. It will also be incapable of storing certain types of information that are necessary to make your volume bootable or encrypted. 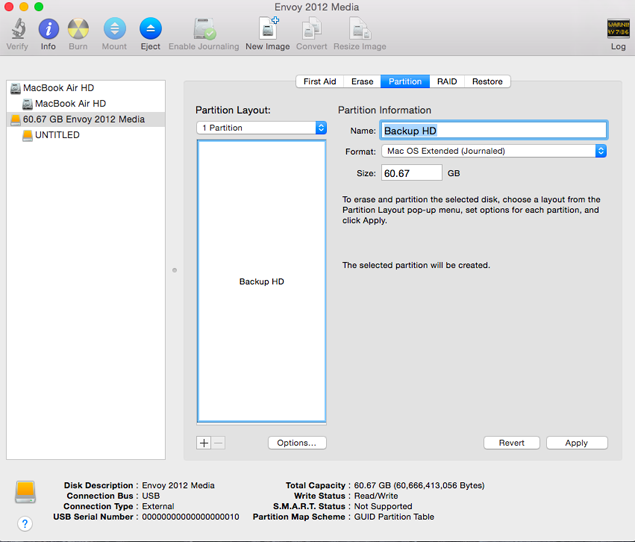 If you have purchased a hard drive that has been pre-formatted for macOS, it still might not be partitioned correctly. Partitioning refers to the process of splitting up the drive into usable volumes. We generally recommend re-formatting and partitioning new hard drives, even if they contain an HFS+ partition on them. A simple formatting of the drive is what most users will want to do. 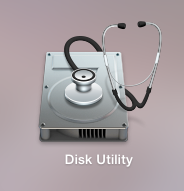 To do this, you will need to launch the Disk Utility application. It is on your system drive in the "Utilities" folder that is within the "Applications" folder. If you use Launchpad, it should be in the "Other" group. 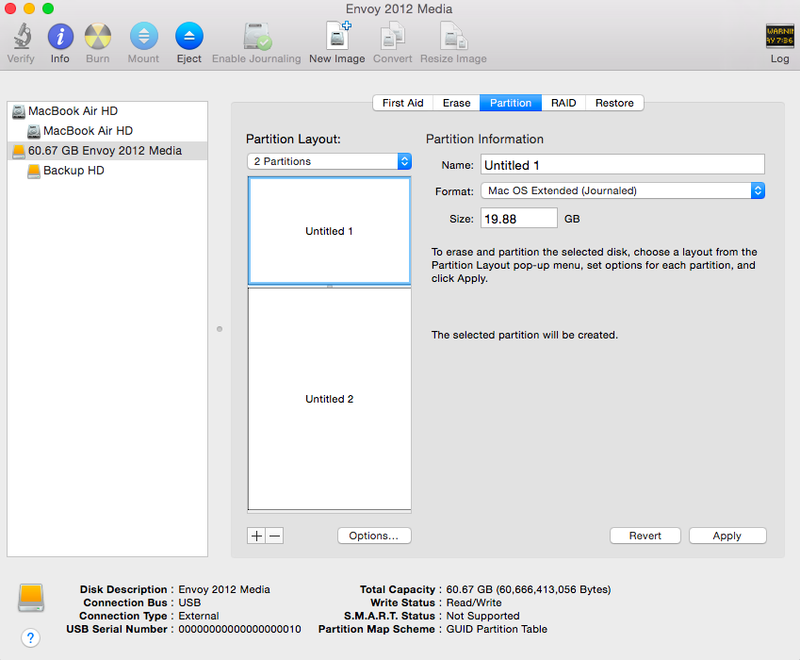 In this case, we have selected the "Envoy 2012 Media" device in the sidebar and then selected the "Partition" tab at the right. This drive is pre-formatted with a single partition named "UNTITLED." The "Format:" popup menu displays "ExFAT", signifying it has been formatted for Windows. Anything other than "macOS Extended" indicates a non-native file system. Note that the format is now "macOS Extended (Journaled)." This is the Mac native filesystem you should use. The only reason not to reformat the drive with a native Mac filesystem is if you plan on using the drive on both Macs and Windows PCs. If that's the case, and your drive is already formatted for "ExFAT" or "MS-DOS", you can quit Disk Utility now and stop reading this guide! If you want to change from a Mac native filesystem to a Windows native one, we recommend choosing "ExFAT" — it is a better choice for larger capacity drives. Once the desired format has been selected, you should supply a name in the "Name:" field. This will be the volume name of the partition when it is mounted on the desktop. You should choose something meaningful that describes the role of the hard drive. In this case, we've named it "Backup HD." The next step is to choose the partitioning scheme. This is done by clicking "Options…" beneath the partition layout list. Disk Utility does a pretty good job of explaining the difference between schemes. 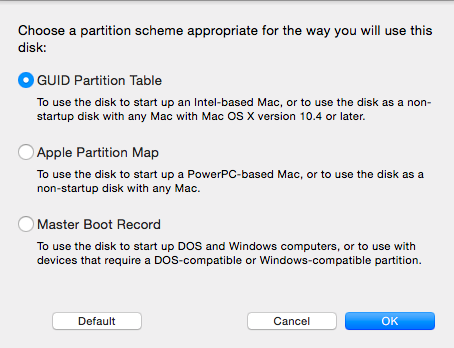 Basically, if you are placing a Mac native filesystem on the drive, you will want to choose "GUID Partition Table." If you are placing a Windows native filesystem on the drive, choose "Master Boot Record." Only in the rare instance where you are creating a bootable backup of an old, Power-PC based Mac would you choose the "Apple Partition Map" option. Once your choice is made, click "OK."
You are now ready to perform the formatting. Do this by clicking the "Apply" button at the bottom right corner. Important: be absolutely sure you have selected the correct device from the list of devices on the left. Once you have re-formatted the drive, any data presently stored on it will be lost! Clicking the "Apply" button will display a warning sheet asking if you are sure you want to reformat the selected volume. This is the time to ask yourself if you are really sure! The formatting operation is relatively quick. Larger drives may take a bit longer to format but they should still take well under a minute to complete. Note: After partitioning is complete, the operating system might step in and ask if you want to use this volume for Time Machine backups. Depending on what the intended role for the hard drive is, you may or may not want to do this. If you are unsure, just select "No" — you can always change that at a later date by visiting the Time Machine System Preference pane. Once finished, the device will appear in the sidebar with the newly partitioned volume listed below it. You have now completed your simple format and may use the new drive for backups and synchronizations with ChronoSync! If you have a large hard drive, you may want to consider splitting it up into multiple partitions. Partitioning refers to splitting the drive up into slices, each one representing a separate, logical volume. It basically makes your single hard drive behave like multiple hard drives. The primary reason you would want to partition a hard drive is to separate it based on different roles. 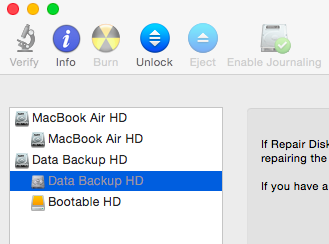 For instance, you may want one partition to contain a bootable backup of your system drive. Another partition can contain a data-only backup and yet another partition can be used for storing a specific type of data such as music files. How you divide and use your hard drive is entirely up to you. 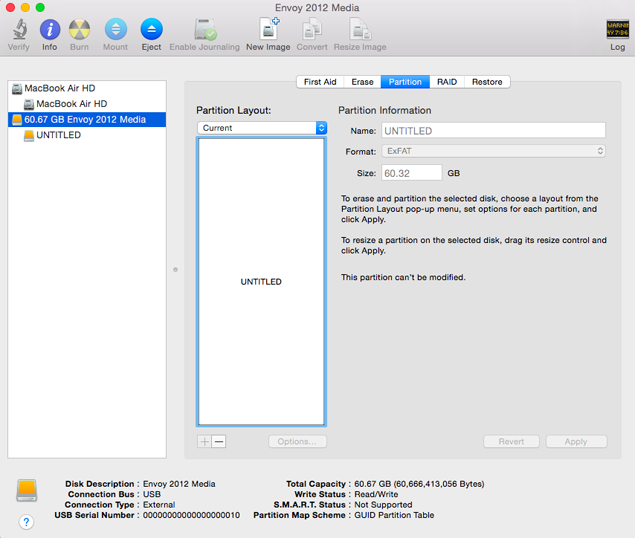 To adjust the size of each partition, you can click and drag the divider that appears between the two partitions in the partition layout list. You can also click on the partition name within the list and then type in the desired size in the "Size:" field. 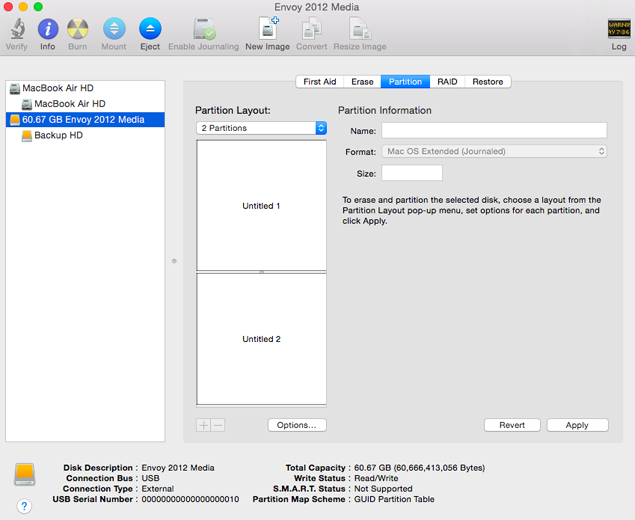 Regardless of how you adjust the partition size, you will definitely want to rename the partitions. This is done by clicking the partition name in the partition layout list and then typing in the desired name in the "Name:" field. Choose meaningful names that identify the role of each partition. After defining your partitions, proceed by confirming the partition scheme and applying your settings as explained in SIMPLE FORMAT, above. Important: be absolutely sure you have selected the correct device from the list of devices on the left. Once you have re-formatted the drive, any data presently stored on it will be lost! Clicking the "Apply" button will display a warning sheet asking if you are sure you want to re-partition the selected volume. This is the time to ask yourself if you are really sure! Your partitions will then appear as logical volumes beneath the device name in the sidebar. You have now completed your multi-partition format and may use the new drive for backups and synchronizations with ChronoSync! After a drive has been formatted and partitioned, you have the option of encrypting one or all the partitions on the drive. Encrypting a partition scrambles the data stored on the drive in such a way that it can only be unscrambled by knowing the encryption key — or password — used to scramble the data. With that key, the data simply cannot be interpreted in a meaningful way. This is a very good technique to keep highly sensitive information safe from prying eyes! After making the choice, choose "Erase…"
Important: Make absolutely sure you have chosen the correct partition from the sidebar on the left since any existing data on the partition will be wiped out by this action! You will have to specify the password key twice to make sure you have typed it correctly. Be very careful on your choice of password — you need to remember it or else you will never be able to access the data on the partition! We suggest you make use of the "Hint:" field to provide an obscure reference that would serve to remind you what password you have specified. The hint will be displayed after several failed attempts at supplying your password. This prompt will be displayed when you startup your computer with the hard drive attached or if you attach the hard drive after you have started up. In order to access the "Data Backup HD" volume, you must supply the password key you specified when you converted it to an encrypted volume. Without the correct key, you will not be able to mount and access the volume. You will then have another opportunity to supply the password key. Upon successful authorization, the volume will mount and you may use it just like any other hard drive volume. 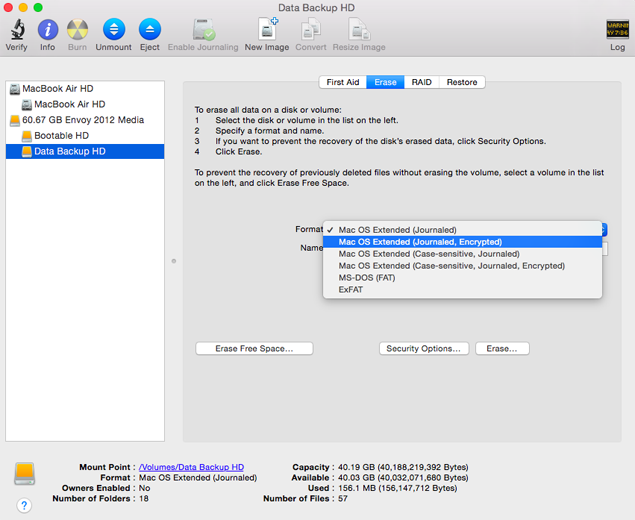 Note: The above example converted the "Data Backup HD" partition to be an encrypted volume. We could have also converted the "Bootable HD" partition and later created a bootable backup on that same volume. See our tech-note, Create a Recovery Partition on Your Bootable Backup Disk, for more information. When following the above examples, you have probably noticed the "macOS Extended (Case-sensitive)" option when choosing the format of a partition. This is a perfectly legitimate choice and it will work fine as a native macOS filesystem. However, you should make this choice with care. The standard variant of the "macOS Extended" filesystem is case preserving and case insensitive. This means that you can supply mixed case letters to a filename but the operating system will not pay attention to filename case when identifying the file. Thus you may name a file "My Document" and the operating system will preserve that. However, the operating system will identify a file named "My Document" and one named "my document" as the very same file. The reason this becomes important is when you use a program like ChronoSync to synchronize and backup your files. You want to make sure that the source and destination volumes have the same filename case handling characteristics as each other. Otherwise, ChronoSync (and other programs) may interpret and compare filenames in ways that you did not expect.